Learn in 7 days what took us 5 years! This guide will help you prepare for your move abroad! 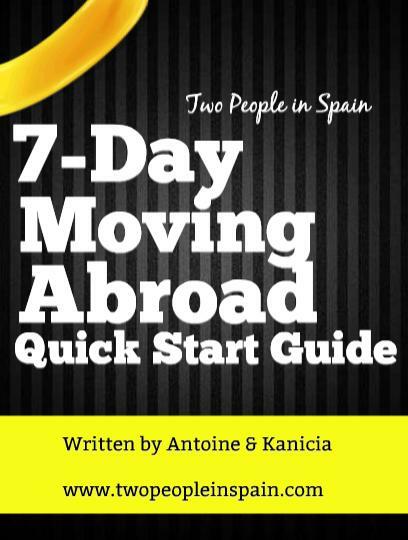 This guide was written by Antoine and Kanicia from Two People in Spain. It is the culmination of the most valuable lessons that you can benefit from based on their experience of moving to Spain. Learn what things to consider before you make the move. Avoid making the same mistakes and ensure a smooth transition to the new country. Over the next seven days you will receive an email once a day with a valuable lesson as well as an action step that you can take! "This has been extremely helpful! My husband and I are planning to go serve in a foreign land at the end of the year. Thinking about a Central American country, Spain or Italy. We live in California and also speak Spanish. Just bought Rosetta Stone in Italian to be prepared. However still praying for direction. Your articles gave us a lot to think about. Thanks so much." "We really enjoyed the 7-day guide. Great practical advice." "Really simple, efficient & practical guide." Thank you for signing up for the Free 7 Day Moving Abroad Guide. You will start receiving your first email tomorrow!